I really can’t believe that you are 1 year old now. There are moments in life that I know I will never forget, and the moment when they told us you were a boy and when I saw you, is one of them. “It’s a boy!” We really couldn’t wait for them to show you to us from behind the curtain, so we asked. It was just so exciting in the moment. Then I got to see you, and it all fell into place. You were meant to be, and meant to be in our family. You have really been a easy, happy, joyful little boy. There have been few difficulties or moments when you were really fussy or unhappy. Of course, when you you were in daycare you were often sick but you never seemed to unhappy. Ah, my poor sick coughing boy! I am really proud of the fact that we have reached a year on our breastfeeding journey. After having so many struggles with your sister, I was really happy to have such an easy experience with you. The beginning was quite painful at times, but once that period passed it was quite a breeze. You still are nursing during the day, before bed, and 1x during the middle of the night, so I’ll take it upon you to let me know when you are ready to wean. Overall, it really feels like this year has flown by way too fast. From swaddling you to get you to sleep, to just holding you on my left side and patting your back with my right hand to get you mellow out enough to rest your head on my shoulder. Or propping you up on the sofa for your monthly picture to reminding you to not try to climb over the back of it! Throwing something is your favorite thing to do, even if it means you wack me in the face with a book. You don’t mean it to hurt, but throwing everything around is just the funnest thing ever. Dropping things from our second floor on the stairs below is also hilarious. You still just have 2 teeth, but you make great work of all of the food you eat with them. Blueberries, banana, guac, and steak, but you’ll happily eat anything. Doing baby led weaning with you, and your sister, was the best for you guys. We love that you are so eager to eat, especially blueberries- you grunt and reach out when for them like they are the best things on earth. One of my favorite things you do is say “hi” while you hold my phone to your ear. It’s the cutest thing! I love the voice you do while you say it- so soft and sweet. We keep wondering when you will walk since you prefer to crawl and stand. Actually, it’s more like a football bear crawl since we got the carpet taken out of the first floor. You are so strong and fast as you crawl around and then pop up to stand and then trow something from there. I love that the little things bring you such joy, and I am there to be able to see it. It’s obvious to say that, I am really looking forward to seeing how you grow and develop in the weeks, months, and years ahead. This past month has really been wonderful with you. So far transitioning to be a stay at home mom with you has really easy and enjoyable. Spending days with you, and your sister, is so fun. There are tough times when I want to hide in the pantry to take a break from the noise, but it’s so great. We just need to have Autumn listen to us the first time that she can’t keep siting behind you. We understand she is trying to be helpful, but from siting behind you so she can catch you if you fall, quickly turns into her holding you, which makes you yell and squirm and then there is the constant “AUTUMN!” It’s hard to scold it when she means well, but things would be so much easier if she just listened. At least she means well. I swear you are looking older and older every day with your hair growing in and your features becoming more and more defined. It’s amazing to see. I see so much of your daddy when I look at you and old pictures of him. You even have that pout down. I can’t imagine our house ever being quite again since you can be so loud when you are happily babbling. Angry or tired babbling is just as loud, but the happy, silly, giggly babbles are much more fun. You have mastered standing while holding on to something like a pro. From there you sometimes give us a wave. But you are really good at waving when we are holding you and you then are prompted to wave at someone. You went on your first cruise this past month! You were so fantastic on board. I can’t wait to take you on more and more as you grow. Our first family vacation went so well. Half a year with you!! 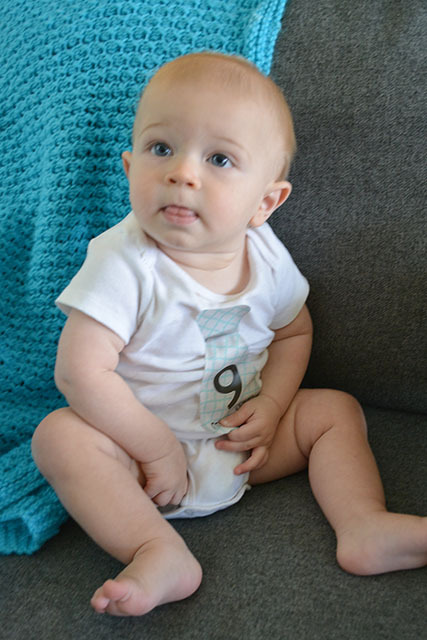 I still can’t believe that 6 months has already sped by. You make every day so wonderful. I’m in awe of your bubbly personality. You hardly fuss as you are just content with with held, being on the floor, playing with toys, or with Autumn. Plus, you make everyone really happy with your smiles and giggles. Your smiles are like yawns, they are contagious. You have mastered sitting up. It’s amazing to see you sitting up and looking around, taking the world in. You really like to watch Autumn and the dogs. Besides just being able to balance you are able to be on your back or belly and twist and turn to pop yourself up to sit up. Sometimes you pause while doing it, and you look so suave as you are sprawled out on your side, minus the come hither look. ha! You are so close to crawling too. that it is just a matter of days. You spin and roll around on the floor, meandering around as you wiggle this way and that, but you are really going to take off very soon. I can’t even begin to imagine what the next month holds, besides getting to celebrate your first Christmas, but I can’t wait for it.